It may not officially be spring yet, but with temperatures slowly creeping up and the sun staying out just a bit longer each day – spring fever is starting to set in. 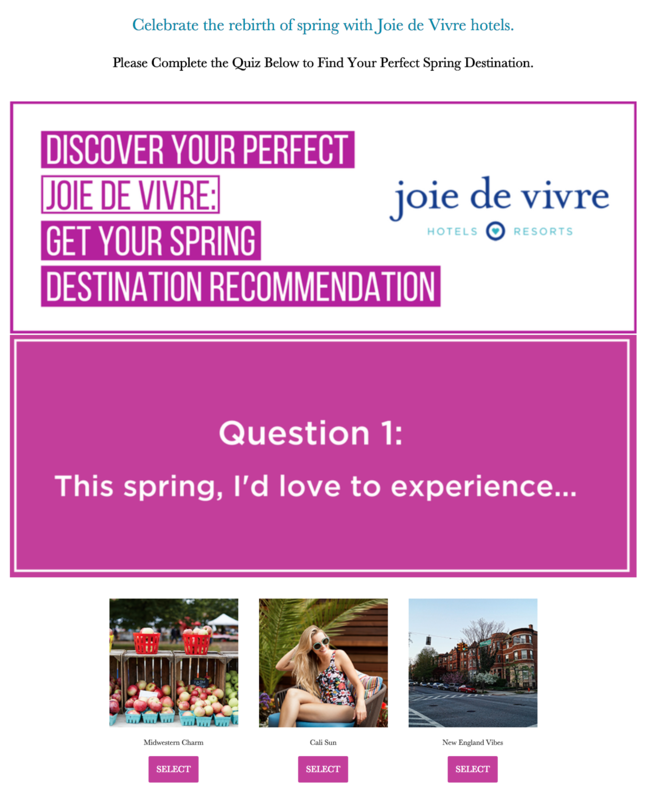 To reawaken the feeling of spring in their guests, Joie de Vivre Hotels created and published an interactive quiz on their website to boost interaction and to inspire visitors to book their next spring vacation. The Joie de Vivre team also took the audience data collected from their quiz to launch a retargeting campaign with social media ads on Facebook and Instagram using location specific copy and imagery based on their website visitors quiz results. From now until April 30th, visitors will be able to take an interactive quiz embedded on Joie de Vivre Hotels’ website to find out their perfect spring destination and receive up to a 25% off discounted rate when they book a stay during the promotion. We personally took their quiz and can’t wait to head west for our spring vacation – look out San Francisco, here we come! 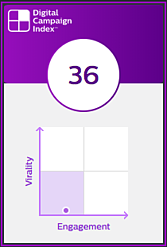 Joie de Vivre Hotels DCI score is a combination of an Engagement Score (ES) of 61 and Virality Score (VS) of <25, and is a great example of how quizzes can be applied to increase online engagement and provide consumers with an interactive element to capture audience data and build out your CRM database. Check out more details on best practices any brand can incorporate into their interactive marketing campaigns below. Tap into your consumers curiosity. Personality quizzes are often so appealing to consumers, because we are all constantly on the hunt to understand more about ourselves and others. At all of our cores we are curious and quizzes offer a simple and easy way to learn something new about ourselves and quickly relate and identify with other people that got a similar result. The struggle can be real. Making decisions can be difficult. What to get for dinner? Where to go on vacation? What would your Real Housewives tag line be? Brands that have published quizzes as a method for helping their consumers make these decisions and more have seen the payoff through increased website traffic, spikes in engagement and high-quality email acquisitions. Channel the HQ Trivia Mania. Two things we’ve learned at Wyng over the last seven years is that consumers love taking and sharing quiz results on social media and posting photos of babies and cats. Quizzes are great conversation starters on social media and open the door for friends, families and or random internet lurkers to like, comment, and share their own quiz results. A quiz offers the perfect opportunity for people to share something about themselves without coming off vain. So, don’t waste any time, head over to Joie de Vivre’s spring destination quiz and find out where you should be heading for a bit of quality R&R.